You don't need access to fancy test gear to check and fault-find computer data cables. Instead, this simple device will give a quick indication of the status of point-to-point cable wiring; ie, crossovers, shorts and open circuits. 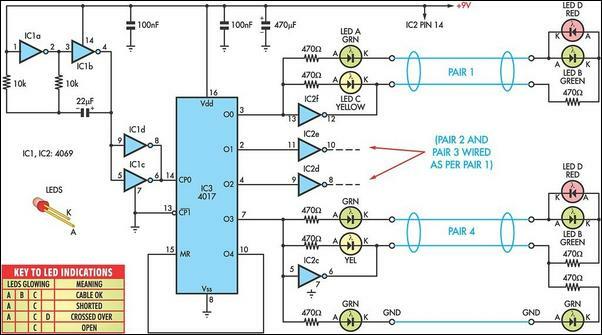 It works like this: IC1a & IC1b (part of a 4069 hex inverter IC) form an oscillator which provides a 1Hz clock signal. Its output is buffered and inverted by IC1c and IC1d (connected in parallel) and clocks IC3, a 4017 decade counter. IC3's O4 output is connected back to its reset pin (pin 15). As a result, IC3 toggles its O0 - O4 outputs high (and low) in sequence to test the four data pairs and the ground (GND) connection (if required). In operation, IC3's outputs drive the indicator LEDs and inverters IC2c-IC2f. Note that there are four indicator LEDs for each pair. LEDs A & C connect to the local end of the cable, while LEDs B & D connect to the remote end. The inverted outputs provide the return paths for the relevant "mate" of each tested pair. As a result, if the cable is OK, LEDs A, B & C will all light for each tested pair. The "D" LEDs at the remote end indicate if there is a crossover in the cable, while the "C" LEDs indicate which pair is being tested. As well, two extra LEDs are connected in series with the GND lead (one at either end) to indicate its status. These LEDs are driven by the O3 output of IC3 via 470W resistors. Finally, note that the LEDs must be high-brightness types.